Please come and visit us for a free tasting of our whole range of fine wines. 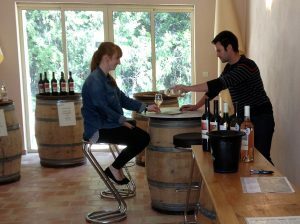 On request (appointment required), we can also organize for you a free visit of the winery and the cellar. Outside these hours, or from October to April, please contact us for an appointment. Important note : you can make an appointment by phone, e-mail or through our contact form (page “Contact us”) at least 48h in advance.